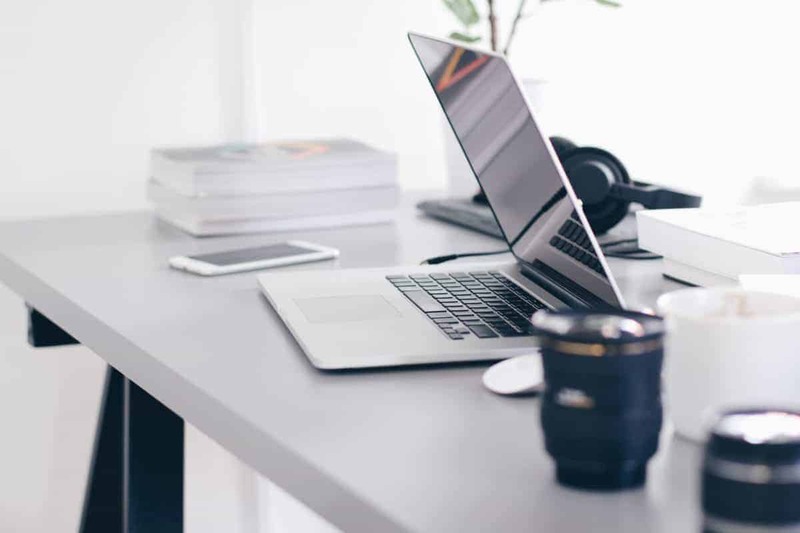 So you keep coming across these income reports where individuals are making thousands upon thousands of dollars a month blogging. You are interested, but feel like it is “impossible” to become a full-time blogger and make money from home. You want more freedom and financial independence in life, but don’t know where to start. Do these things sound familiar? If so you have come to the right place! Today I am going to walk you step-by-step on how to become a full-time blogger in less than a year. These were the 5 steps Brittany and I took to create a successful blog. Our blog allowed me to quit my job and earn a full-time income working from home. We now have months where we are making over $10,000 in a single month. It’s still surreal to even think about. If you are already a blogger or have been thinking about starting a blog this article should help you simplify the process and get you pointed in the right direction for success. This might seem obvious, but all too often people have a “failure to launch syndrome”. You can start your own blog here with our easy step-by-step tutorial. Using our tutorial you can start your blog for as little as $2.95 per month and receive a FREE domain name when you use our tutorial to get started. We also put together a free 7-day email course on how to start a successful money making blog. If you have not gotten started yet this is a great place to start, just fill out the form below. After you have actually started your blog, the next step in becoming a full-time blogger is launching it. Here are the 5 things we focused on when launching our blog. 1. Grab your social media handles. Something a lot of new bloggers forget to do. When it comes to branding you want to make sure a majority of your social media channels are the same. Starting out stick with the “big 4” (Pinterest, Facebook, Twitter, and Instagram). We like using name checker to make this process easy. 2. Create a few pieces of content. Before you launch your blog, you need to create a few pieces of content for people to read. When we started we only had 3 articles for people to read. I would suggest having between 3-5 before launching. 3. Decide a theme and look for your blog. For some reason, this is always a tough decision. Pick a theme you are okay with starting with and know that it can always be changed in the future. Don’t do what we did and change it 3 times the night we launched hahaha. 4. Understand the importance of collecting emails. When it comes to connecting with your readers and earning income nothing is more important that your email list. You can set up a free account with MailChimp to start. Once you are a few months into blogging and starting to make money we highly suggest you switch to ConvertKit. 5. Take a deep breath and hit publish. Go for it! You have nothing to lose and everything to gain. Understand that your blog will never be perfect and it will always be a work in progress. Once you have a good set of content (between 5-20 posts) it’s time to start driving traffic. The absolute BEST way to drive traffic as a new blogger is Pinterest. It’s a visual search engine that is evergreen. It’s completely different than any other social media platform. After taking Pinterest Traffic Avalanche we started getting ~100k-page views a month to our site. The best part is all of this traffic was FREE organic traffic from Pinterest & Google. Once you drive enough traffic (25k-100k monthly sessions) you can apply to an ad network like MediaVine or AdThrive. This is where the passive income happens with your blog. From our own personal experience, you can start getting paid between $15-$25 per 1k user session on your site. We have been easily paying our monthly mortgage with our ad revenue alone! Here is another great article we wrote that goes a little deeper into driving traffic to your blog 10 Blogging Tips That Will Make You Grow Quickly. 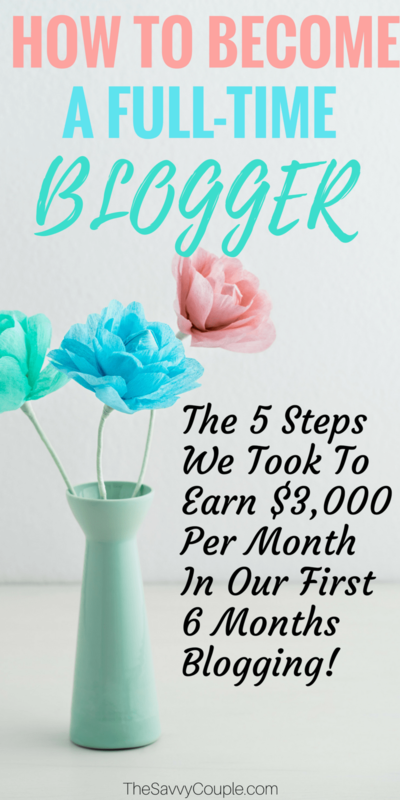 When we first started blogging we had no idea how to turn our traffic into income. But we took the time to learn how to monetize our blog which really propelled me forward in becoming a full-time blogger. The fastest and easiest way to start making money from your blog is through affiliate marketing. I can honestly say I have never come across a professional blogger that does not use affiliate marketing to drive sales from their blog. We avoided learning affiliate marketing for the first 6 months of running our blog, HUGE MISTAKE! Within a month after taking Making Sense of Affiliate Marketing we started earning hundreds of dollars a month promoting products and services we were already obsessed with. This is the last step in becoming a full-time blogger and start to make some serious money. As crazy as it sounds we have been blogging for over a year and the only product we have to show for it is our blog coaching service. That’s not to say we are not brainstorming digital products, other services, and courses. Most professional blogger making $5,000 per month or more have their own product and services they sell. This is by far the most profitable way to monetize your blog, but also takes the most time and effort. It is important to realize that you cannot just start your blog and jump to this step. It is critical to take each step and master it before moving onto the next. It would be near impossible to sell your own product without a large number of engaged readers that you have built trust with. 6. *BONUS* Don’t Give Up! Okay, we have one final step and we saved the best for last. The #1 reason bloggers fail is they give up too quickly. Becoming a full-time blogger takes time, effort, and a little bit of grit to get over the learning curve. If you truly want to become a full-time blogger you 100% can. You just have to get started! Keep moving forward each day and realize the time you put in today will pay off a year from now. How can we help you start your blog? Awesome post! I just made my first affiliate sale today and I’m so excited right now!!! All I’ve been really doing is driving traffic through Pinterest. I promote my pins every day on 38 group boards. I also set up recurring posts on Twitter but I’ve only gotten a few clicks from there. Awesome! Sounds like your definitely heading in the right direction. This blogging thing is pretty great! This is a great post! I love how much info that’s on here… it’s really refreshing to read useful and new info after reading all of the same stuff on Pinterest! Thanks!! Anytime, glad you found the article useful Erin. I love this. I was talking to my husband last night about goals for the site I am going to be launching in the next few weeks. I basically told him within 6 months I should be making some money and within 18 months I will replace my income. Now to hustle and get there! I am excited and willing to put in the work even though there is very little reward to start. That’s so awesome to hear Sara. The hardest part is committing to it and getting over the learning curve. You got this! This is definitely one of the most helpful “start your blog” articles I have read. My biggest fear with starting a blog is the legality of it all. Any tips for that? This is a great “how-to” post. I took away a lot of information. However, I was interested in taking the free 7-day email course, but I didn’t find the form to fill out to get started. If you could provide a link so I can access the form or just put me on the email list for the course that would be great. Thanks so much! You always have some great info or tidbit I take away from your other emails. Hopefully I will be sharing my success story with you soon. Thanks for the great information! It helps a lot! I have been trying to blog for the past few years, but guess I am not consistent enough of doing it. Thanks for the sharing again! Absolutely glad we could help! Thanks for the tips. I can’t wait to look into the Pinterest course. I get hardly any traffic from this but know it will make a huge difference in traffic if I can get this down. Thanks again. Our pleasure. Email us with any questions you might have about the Pinterest course we are more than happy to answer them. $3000 per month in your first 6 months is amazing! I am 3 months in and have made my first $10 ? we all start somewhere right?! That was actually when we first started making income. We blogged part-time for 9+ months before making a dime. I will have to go back and adjust that chart. Very informational! Trying to decide if this is something I want to do. I don`t think I have ever found a more articulated and simpler article than this one, showing exact networks, platforms etc. Great post!